Is it raining outside? Then you got to make this dish to get the sunshine within you :) no kidding :) If you know about Aloo Bonda, then you should feel comfortable with Batata Vada, the difference though is that, the latter uses garlic as one of the main ingredients.Technically, I feel it is more a Bonda than Vada :) Batata (Potato)Vada (fritters)is a Maharashtrian delight. I associate this to something like Falafel. 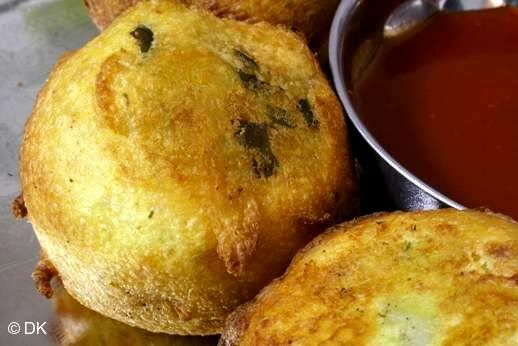 Just as how Falafel forms a part, but yet good enough as stand alone, of Pita bread, so is Batata Vada. 2. Make small balls out of them. 3. 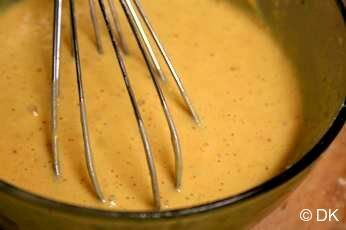 Mix all the ingredients for the Batter, add some water till you get a thick batter. It should be thick enough to make a smooth coating for the potato balls. 4. 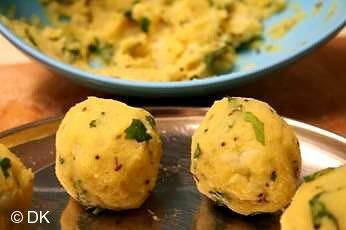 Drop the prepared balls in the batter, coat them with all over. 5. Drop these balls in a skillet with hot oil. Fry them. Take care to see that oil is not too hot. 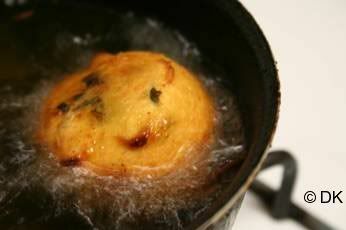 Keep it med-high and once you drop the vada inside lower the heat a bit. 6. Remove when reddish yellow. 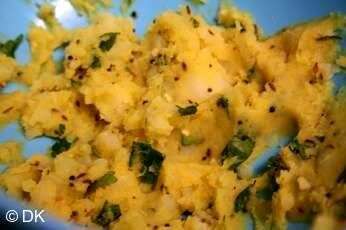 Serve them either with Pav, or all by itself with some ketchup or green chutney. A good Indian cook friend used to make these years ago. Have been hankering for more a long time! I put no salt in the potato mixture because my MIL is on a very restricted sodium diet. 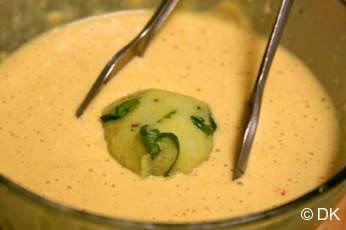 I did put a little in the batter (the chili powder has 35 mg sodium per quarter tsp). Ate them with bottled coriander chutney from the Indian grocery store. Whoa! Was wonderful tastebud walk down memory lane! Thank you so very much! The garlic always makes me want eat more and more of these....delish D! DK its raining here too can i also get some of these? looks yum my personal fav. Here it is cold and this would be a real welcome. Looks so yumm. You are a terrific cook, every time i come here , i go back with wow. 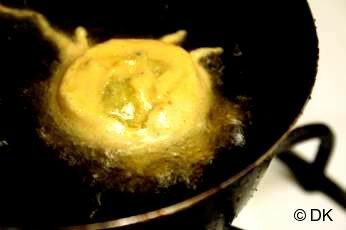 nice vada.....looks yummy...ur pics r tempting.....want to taste it now..
Crispy vada looks great...would love to have it rite now.